I haven’t been the best lately about photographing and posting our veggies from Two Smalls Farms each week. Last week was a beautiful box, so I couldn’t resist snapping a few shots of our loot. Here it is! 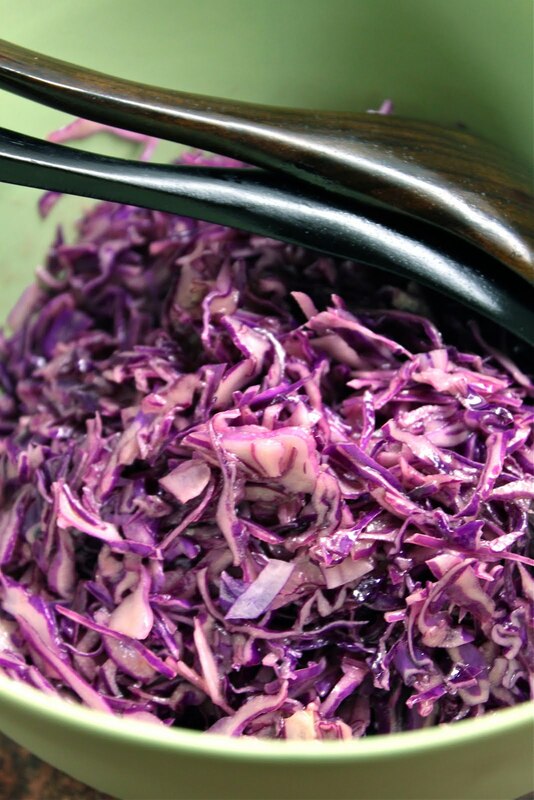 …including the huge red cabbage that I finally finished today! When my co-workers saw my lunch yesterday and today I definitely got a few “Wow…red cabbage AGAIN? ?” Good thing I love it! This entry was posted in CSA, local, seasonal, sustainable on October 24, 2009 by seedsowingmama. This is a pretty simple recipe, but I thought I’d share it with you anyway since it’s a classic French salad. I’ve been reading Alice Waters and Chez Panisse by Thomas McNamee, which has inspired me to write my recipes in a more stream of consciousness manner. 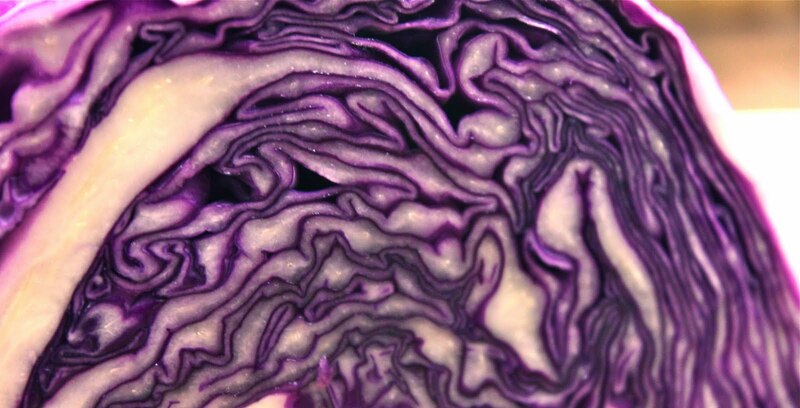 Start with a very fresh head of red cabbage and cut it in half. Then cut one of the halves in half. 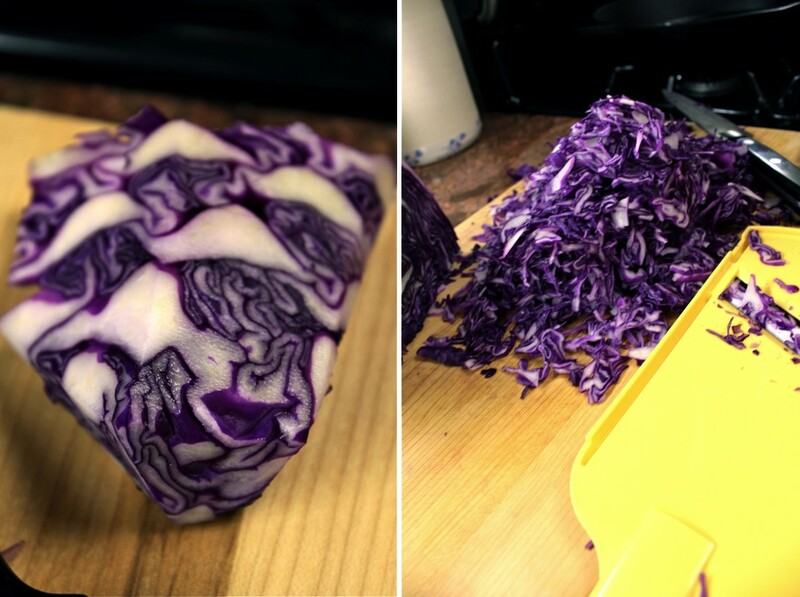 Keep one quarter of the cabbage out and put the remaining pieces in the fridge. 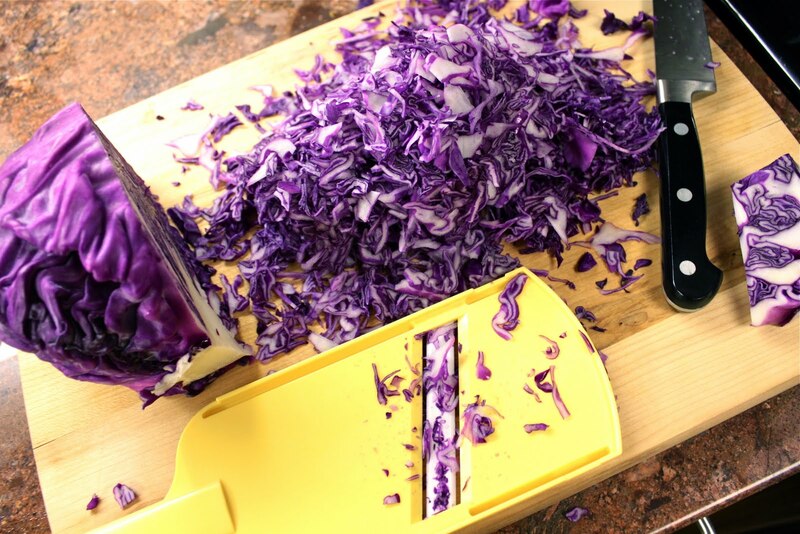 Using a sharp knife or a mandolin, slice the cabbage very thinly, and then give the entire pile a few chops so that the cabbage slices are not too long to eat easily. Next make the vinaigrette in the bottom of a salad bowl. Combine a few small spoonfuls of dijon mustard with a splash of red wine vinegar. I don’t ever measure this so I can’t give you specifics. I like to stick my nose in the bowl and smell to see if there’s a nice mustard-vinegar balance. Add some salt and freshly cracked pepper. Next, slowly drizzle oil into the mustard mixture while beating it with a fork or whisk. I like to use a combination of walnut oil and olive oil. I find that if I use only olive oil, my vinaigrette comes out a bit too fruity. As you whisk in the olive oil, the mixture should emulsify. If you notice that the vinegar and oil are separating, slow down or stop the stream of oil and continue to beat the mixture. Once it begins coming together again, add a little bit more oil (again, I never measure…some people prefer a more vinegary vinaigrette- i.e. me- and some prefer more oily, it’s up to you to decide what you like!). This entry was posted in CSA, farmer's market, paleo, vegetarian on October 19, 2009 by seedsowingmama. Once again I’ve let several weeks go by between posts. This must be a sign that it’s no longer summer, and I’m back to work. I’m loving my internship at the preschool, and I’m still cooking fairly often….just not taking the time to photograph and write about the food. I’m going to try to be better though! This recipe was one I just had to post because Trevor loved it so much. 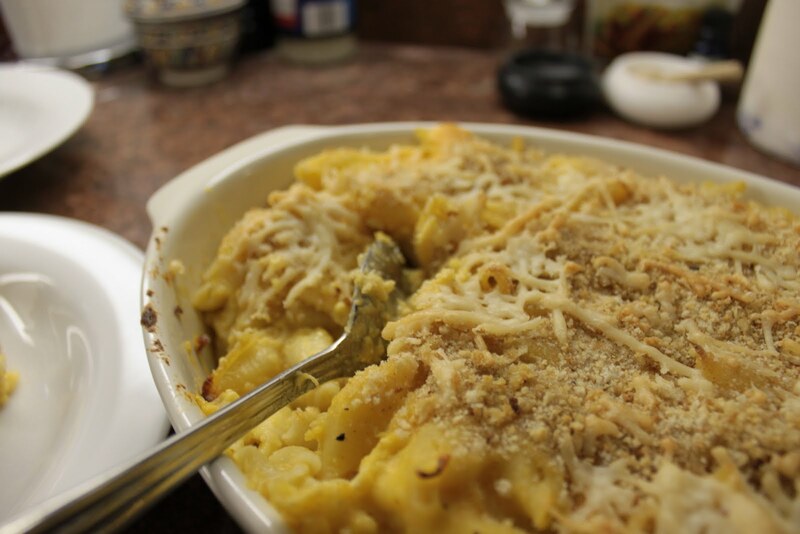 A supposedly “healthy” version of mac and cheese, by Martha Stewart. I actually found the recipe on Kitchen Gadget Girl’s blog, as she planned on cooking this up for her family after receiving a squash in her CSA box a few weeks ago. 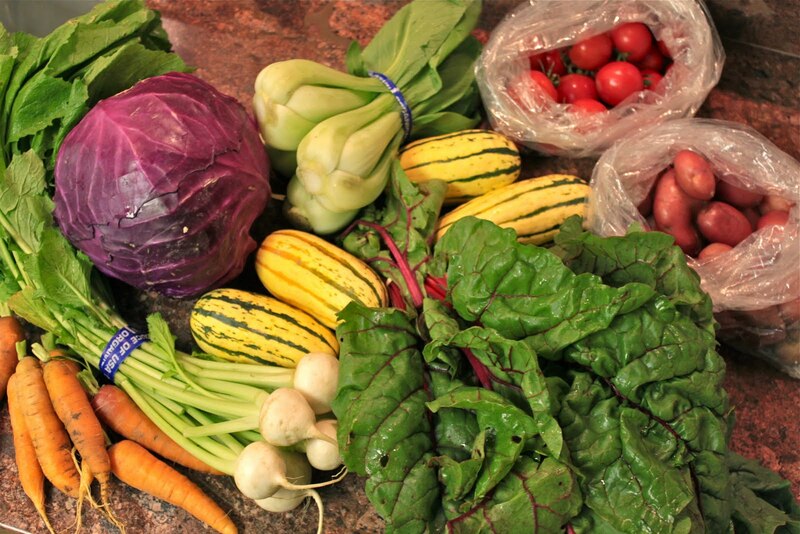 Seeing as we belong to the same CSA (Two Small Farms…a great option if you’re looking for a local food source! ), we also received squash in our box a few weeks ago. In fact, we’ve gotten some delicata squash, some butternut and a sugar pie pumpkin…and this is just the beginning of the fall/winter squash season (and I love it!). Winter squash are wonderful because they’re so versatile, and you can save them for a long time before using them if you’re overwhelmed with other more perishable veggies. Plus, they’re so wonderfully comforting and bring about a strong feeling that fall has finally arrived! 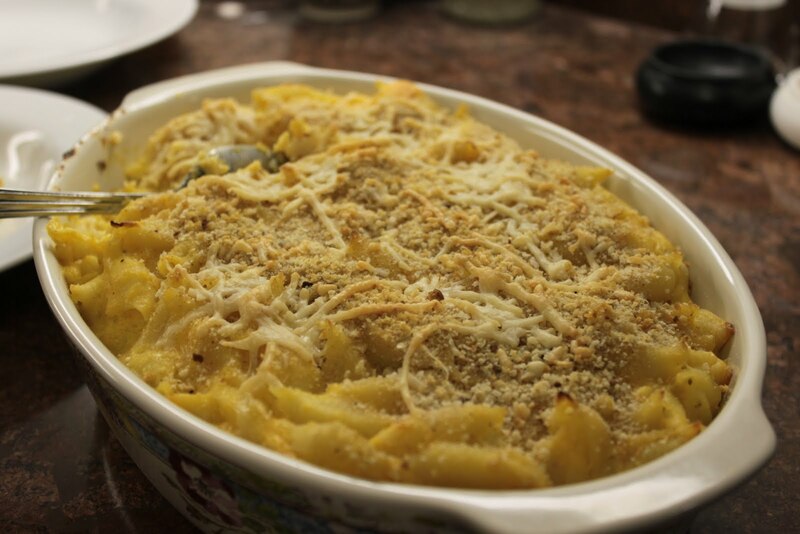 The “Healthy Macaroni and Cheese” recipe from Martha Stewart calls for 1 small butternut squash, but you can substitute any winter squash. Kabocha would be great if you have one, but I had delicata squash, so I decided that would do the trick. As I mentioned earlier, my husband Trevor loved this recipe and would never have guessed that there was squash in the mix so I guess this is a good thing if you’re cooking for a picky eater. 1. Preheat oven to 350 degrees. Peel, seed and cut the squash into 1-inch pieces. Combine the squash, stock and milk in a medium saucepan. Bring to a boil over medium-high heat. Reduce heat to medium and simmer until the squash is tender when pierced with a fork (about 20 minutes). Spoon the squash into a food mill (or alternatively, smash with a fork), and puree the squash, milk and stock together. Add the nutmeg, cayenne, 3/4 tsp salt and pepper. Stir to combine. 2. Bring a large pot of water to boil and add salt. Stir in macaroni pasta and cook according to package directions for al dente. Drain and transfer to a large bowl. Add squash mixture, cheddar, ricotta and 2 Tbsp of Parmesan. Stir until well integrated. 3. Lightly coat a 9-inch square baking dish with cooking spray. Transfer pasta mixture to dish. Mix breadcrumbs, remaining Parmesan and oil in a small bowl. Sprinkle evenly over pasta. 4. Cover with aluminum foil and bake for 20 minutes. Then remove foil and continue baking until lightly browned and crisp on top- about 30 more minutes. Serve immediately. This entry was posted in CSA, easy cooking, sustainable, vegetarian, winter squash on October 14, 2009 by seedsowingmama.